GRIDMAKER > SUPPORT for GridMaker > How do I? ...adjust layout for binding/3-hole punch or to center a grid on a page? ...create fine line grid paper for precise plotting? ...make a 4x4 simple square grid with no subdivisions? ​Q. How do I adjust layout for binding/3-hole punch or to center a grid on a page? 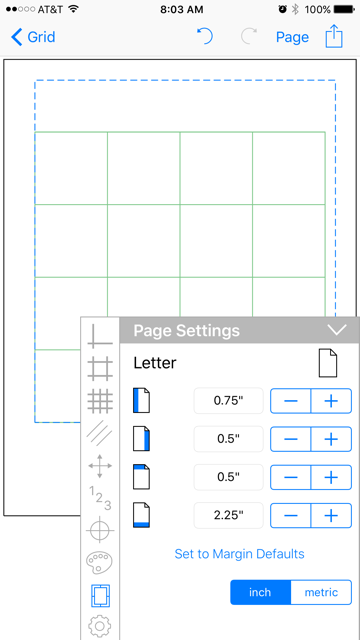 Open a paper in GridMaker. Note the thin black outline around the grid, it outlines the size of the paper. Tap the Page Settings icon and notice the blue line that instantly appears around the grid. This blue line outlines the margins. 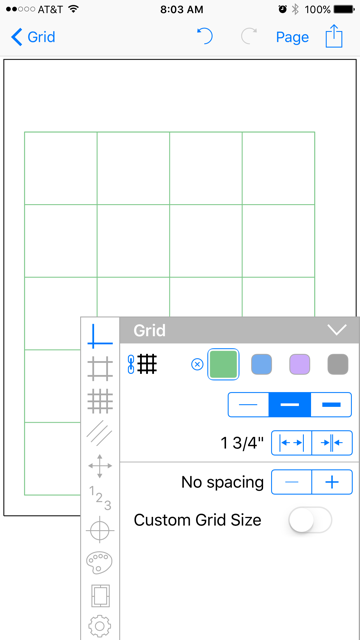 ​To adjust where the grid is located on the page, go to print settings and adjust the page margins (moving the blue lines in or out) to reposition the grid from its default placement (anchored to the lower left corner) to where you'd like. Q. How do I create fine line grid paper for precise plotting? GridMaker offers two ways to provide this emphasis — by line width or by line color. Among the Quick Picks (included with the app) are examples of papers using line width emphasis to make multi-level graph paper. To use color emphasis, unlock the Color Palettes feature through In-App Purchases. With unlimited color Palettes, you can select one of the pre-set color palettes or set up your own custom color ranges. Color emphasis lets you create a gird with finer lines for more precise plotting. Here are more detailed instructions on how to change a multi-level graph from line weight emphasis to color emphasis. Q. How do I make a 4x4 simple square grid with no subdivisions? Tap the icon beside the color bar on the popup. The blue link image to the left tells whether the horizontal and vertical axes are linked. After being tapped, the icon will change to will show the chain (axes) being linked as seen below. The controls for the vertical spacing disappear because the horizontal and vertical controls are now linked to work together. If you don’t link the controls, you can create squares by individually adjusting the horizontal and vertical controls until they are the same. Increase the grid spacing until it is just 4 squares across. In this case, 1 3/4" did the trick. Now, switch over to the Page Settings controls and adjust the page margins (blue dotted line) to center the 4x4 grid. Increasing the bottom margin and also the left margin adjusted the grid to center it on the page. Don't see the paper you need? Send us a note and we'll see what we can do!